Inside view: US car makers and us | What Car? America's car makers have just two weeks left to prove they have viable plans for survival in order to receive billions more in taxpayer loans. It's the equivalent of a serial offender begging for one last chance. What happens if they can't present a convincing case to the US Treasury? Well, it would wreak devastation far beyond Detroit and Michigan - which already has the highest unemployment rate in the US - so it's pretty certain they'll get what they need, even if a few senators cut up rough for a while first. We all know the Americans are in trouble, but our domestic motor industry has problems enough of its own and it's not as if American cars play a significant role in the UK. Just take General Motors (GM), which is asking for another $4 billion on top of the $9.4 billion it has already received. 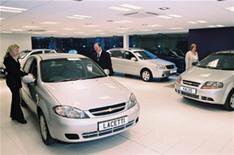 Four of its eight American brands Buick, Pontiac, Saturn and GMC aren't even available here, and the other four Cadillac, Chevrolet, Corvette and Hummer sold less than 20,000 cars in the UK between them during 2008. They'd hardly be missed on this side of the Atlantic, surely? The problem is, GM is far more than just an American company. It also owns Vauxhall in Britain and Opel and Saab in Europe, and it's doubtful any of them would survive for long if the mother ship crashed and burned. GM also has an engine deal with the Fiat group, supplying the Italians with petrol units and buying diesels back in return. There would be much waving of arms in Turin and Milan if GM was to collapse. Suzuki would suffer, too. It makes the Agila for Vauxhall and Opel in Hungary, and would hardly relish the demise of GM piled onto its other woes. The repercussions would be felt not only in Japan, but also in India, where Suzuki is by far the dominant vehicle manufacturer. Then there's the impact on the people who supply millions of parts to GM factories around the world, not to mention the effect on thousands of dealers. Try getting a new headlamp unit for your Corsa or a main dealer to fit it if GM goes bust. Globalisation: it's great when it works, allowing us to have features in our Astras and Vectras that would be unaffordable without the buying power of a giant corporation, but when it goes wrong, it has the potential to leave one cavernous, unholy mess. Tell us your thoughts on this subject by clicking below.